Chemical treatments that sound innocuous or don’t have to be listed on labels are becoming common, but precision application is a must for effectiveness and cost control. Chemicals that don’t sound scary on a label or are processing aids exempt from label disclosure are in high demand for combating bacteria and other food contaminants, and that’s stimulating considerable R&D work in the supplier community. Those clean-label interventions usually command a premium price, so delivery systems that don’t overdose but still deliver a knock-out punch also are in high demand. Rarely is the supplier of the anti-microbial and the delivery system one and the same, however, leaving it up to food companies to prove they are able to deliver a consistent and effective dose of prevention. An exception to the rule is electrochemically activated water (ECA), also known as electrolyzed oxidative water. By combining purified water and sodium chloride (salt) in an electrolytic generator, a chemical reaction creates two fluid streams of sodium chloride, an effective cleaner, and hypochlorous acid, a powerful oxidizer. The chemicals are relatively benign and don’t require users to wear protective gear. ECA had its roots in Soviet R&D in the 1970s, and the Japanese embraced it as an inexpensive alternative to chemicals for carpet cleaning, but it wasn’t until the turn of the century that the technology started to take root in North America. Often positioned as a green alternative to chemical cleaners and sanitizers, ECA can lower operating costs and is believed to be effective against viruses, an advantage that is attracting interest from hatcheries and chicken and turkey growers concerned about avian influenza. Beverage bottlers also are beginning to adopt ECA, though the technology has appeal in all food-grade cleaning and sanitizing applications. The sanitizer has been used in direct contact with meat and poultry, though FDA sets a 50ppm limit for free active chlorine, points out Peter Bramsen, project manager-Klarion at Spraying Systems Co., Wheaton, Ill. However, active proteins in the sanitizer can have a negative impact on meat. Bramsen advocates using the solution on food-contact surfaces, where concentrations up to 200 ppm are permitted. Precision spray nozzles are Spraying Systems’ forte, but several years ago the firm acquired an Indiana firm that had developed an ECA system for commercial use. Engineers refined the cell design of the reactor and developed an industrial scale unit, which was dubbed Klarion. Because both the alkaline cleaner and acidic rinse are generated simultaneously, storage of one or both solutions is necessary. Some manufacturers employ a mobile cart outfitted with two buffer tanks; if the tanks are closed, the solutions remain stable up to 60 days. If left open, the solutions quickly dissipate. ECA isn’t the only alternative chemistry based on electrolysis. Adding an electric charge to a fluid can give it magnetism much stronger than gravity, turning a unidirectional spray into an omnidirectional mist. If disinfectant or cleaning chemicals are included in the fluid, the result is a significant reduction in chemical use. Electrostatic sprays have been used effectively for painting automotive vehicles for decades. A quarter of a century ago, a University of Georgia agricultural engineer decided to apply the concept to farming, first for crop applications and more recently on poultry trucks as part of the avian influenza counteroffensive. Table grapes, papaya and other high-value crops were among the first food applications. The magnetic force of the sprayed droplets proved particularly well suited for dispensing mold inhibitors onto cantaloupes and other produce with nooks and crannies, according to Bruce Whiting, president and owner of Electrostatic Spraying Systems, Watkinsville, Ga. Reasoning that “the same thing works for food products as it does on plants out in the field,” Whiting is migrating the technology to food production, both for surface cleaning and direct food contact. In Whiting’s system, a liquid stream is mixed with air in an atomization zone, where a small electrode applies a charge (usually negative). The resulting droplets, typically in the 30-40 micron range, are blown toward a target but are able to turn and pivot, defying gravity as they seek grounding on the target. “We say we save 25 percent on chemical use, though some clients report savings of 50 percent or more,” he says. As much as 80 percent less water is used, an important factor in reducing drying time between sanitation and line start-up. ESS was a first-time exhibitor at January’s International Production & Processing Expo (IPPE) in Atlanta, where the firm showcased a 30-lb. backpack unit that can mist surfaces for two-plus hours before recharging. In a technical presentation, Whiting told attendees Tyson was testing the technology for beef carcass spraying, although it’s up to the processor to demonstrate the efficacy of the antimicrobial treatment. The same prove-it requirement applies to ultrasonic spray coating of whole muscle and slices of deli meat. Companies like Spraying Systems and Sono-Tek Corp. work closely with vendors of antimicrobial treatments, but it is up to suppliers such as A&B Ingredients and phage developer Micreos, working closely with processors, to demonstrate the reliability and consistency of an application in a specific plant’s process. The maxim "better safe than sorry" is food safety’s rule of thumb, and many products are overcooked or overdosed to ensure safety. But the combination of a clean-label focus and the high cost of new treatment options is putting a premium on precision when applying antimicrobials. Joseph Riemer, vice president-food business development at Milton, N.Y.-based Sono-Tek, cites the example of lauric arginate, a saturated fatty acid with bactericidal properties. If dosing is below 50ppm, it qualifies as a processing aid and doesn’t require label disclosure. Last month, Riemer was issued a U.S. patent for an ultrasonic atomizing nozzle that gives processors greater control in high-speed dosing of antimicrobials than nozzles powered by hydraulic pressure. Piezoelectric transducers create mechanical motion in the nozzle’s atomizing section, producing droplets in the 5-50 micron diameter range, compared to up to 500 microns with hydraulic nozzles. The larger droplets “create a small swimming pool” on the surface of food, he contends. USDA has strict requirements for combating listeria monocytogenes in ready-to-eat meat and poultry, but some customers are beginning to go beyond those standards. According to Riemer, Sysco began requiring a validated post-lethality treatment with a listeria reduction treatment late last year, as well as an inhibiting antimicrobial in the formulation. Many processors are opting for HPP treatment to satisfy the requirement, but Reimer maintains surface treatment at packaging is a simpler, less costly alternative -- provided consistent dosing can be validated. No antimicrobial can deliver both bacteristatic and bactericidal protection, allows Roger Maehler, senior director-seasoning R&D at Newly Weds Foods. But if an additive can both inhibit growth and lower the temperature at which surviving pathogens are killed, food safety is enhanced. That was the goal of researchers in Chicago-based Newly Weds’ IsoState products group when developing DefenStat, a clean-label additive introduced at IPPE. Designed for raw meat and poultry, the ingredient was developed over three years to address the problem of inadequate refrigeration temperatures during distribution and storage. Refrigeration is the primary defense against bacterial growth, yet 40 percent of raw products experience higher than acceptable temperatures, according to Maehler. DefenStat inhibits microbial growth in that event and as a result of cross contamination. It also makes remaining pathogens susceptible to thermal destruction at temperatures about 12°F lower than the recommended critical control point. For example, steak should be cooked to 145° and poultry 165°. With DefenStat, a 133° steak or 153° chicken most likely wouldn’t pose a health risk. Listing such an ingredient as vinegar or lactate on a label might pass muster with consumers, but listing nano silver would give many people pause. Residual levels of silver dihydrogen citrate (SDC) of up to 30ppm on poultry and produce, on the other hand, are deemed acceptable processing aids by FDA, exempting SDC from label disclosure, according to Hank Lambert, CEO of Pure Bioscience Inc. And he has a letter of no objection (LNO) from FDA to prove it. El Cajon, Calif.-based Pure attained EPA registration for its food-contact surface sanitizer and environmental disinfectant several years ago, but last year it petitioned FDA for use of SDC in direct contact with food. 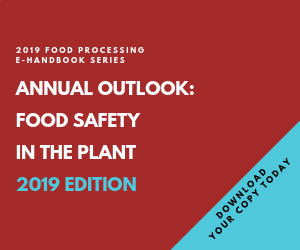 Approvals recently were received for both poultry and produce, and FDA issued a LNO for raw fruits and vegetables in February. Lambert expects a similar letter for poultry in the spring. Unlike most chemicals, SDC’s effectiveness in killing bacteria, mold and viruses is not impacted by temperature. However, rigor in mixing and blending silver ions in citrus acid and water to achieve the correct suspension must be followed. Pure worked with Spraying Systems and an engineering firm to develop a skid-mounted system to ensure correct procedures are followed before the fluid reaches the nozzle and beyond. Human beings are a sometimes overlooked source of cross-contamination, along with the air itself in a plant. Vendors are beginning to upgrade hand-washing stations. The humble towel dispenser is the initial focus of SCA Americas, the Philadelphia-based subsidiary of the Swedish firm Svenska Cellulosa Aktiebolaget. SCA is segueing from foodservice to industrial food production, beginning with a high-capacity towel dispenser that’s been certified by HACCP International. Fewer roll changes is a convenience, but hygienic design is the more important benefit, thanks to the elimination of harborage points and contours that tolerate high-pressure washdown. Hand washing seems prosaic, but the devil is in the details when combating invisible threats to food safety. In today’s environment, a button-down approach is the order of the day.